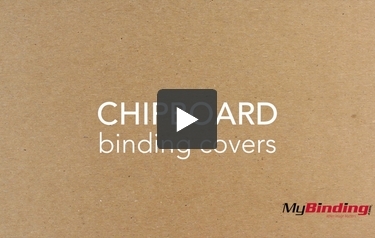 Oh boy, do we have you covered when it comes to chip board covers! Our large selection of high quality 100% recycled chipboard covers are ideal for adding rigidity to your reports, presentations, proposals, or notebooks. While chipboard covers are often used on the back of note books, they can be used with virtually any of the binding styles that we carry. If you don't have a heavy duty commercial binding punch you may want to consider purchasing these covers pre-punched to help prolong the life of your machine. In fact, many small binding punches won't punch chip board since it is so dense and is often thicker than the opening on the machine will allow. Our chipboard covers are available in thicknesses ranging from 18pt up to 46pt thick and come in virtually any size that you can imagine. Plus, Chipboard covers can be wrapped, painted, die cut stamped or punched for virtually any project. Transcript: This is Chipboard Binding Covers. They come in sizes ranging from 5.5" x 8.5" up to 12" x 18". You can choose to add a custom window to your covers or add rounded corners to your oversized cover sheets. The most common use of Chipboard is as a back cover, supporting your project so it doesn't wrinkle and making it easier to write on the pages. Even select from 8 punch patterns to receive your pages prepunched. Look for the variations in thickness, from 18pt to 48pt. This is Chipboard Binding Covers. Our chipboard is made completely of 100% recycled material.